Review: Throughout life, you will probably compare many things and see how much two different things may be alike in a number of ways. This is certainly applicable when it comes to the world of film. Many people compare this film to that film through various criteria, and while some films do share similarities, when it comes to the filmography of one Wes Anderson, it is almost clutching at straws to compare his works to any other film that graces our screens every year, because there really isn’t anything quite like them, and with his latest picture, that trend continues in glorious fashion. With a rather large cast in this film, it would seem difficult to stand out, Ralph Fiennes certainly does giving a truly exceptional performance as Gustave H. Prone to outbursts of rather posh sounding expletives aimed at policeman and anyone who dares to be rude to his lobby boy companion, his performance is an undeniable highlight of this picture and was arguably unlucky to miss out on a Best Actor nomination. It is always rather satisfying to hear someone swear in such an elegant manner and through his upper class accent and elegance, he provided some of the most entertaining dialogue of 2014. Newcomer Tony Revelori bursts onto the scene in a terrific debut performance as the lobby boy Zero. The chemistry between the two provides some compelling and extremely entertaining viewing as they go on their adventures of trying to ensure the valuable painting does not fall into the wrong hands. Willem Dafoe is no stranger to the role of a villain, but here he’s not so much Green Goblin, instead channeling a Bond like sort of villain, and here he is again in spectacular form. Through all the quirkiness and comedy, the film does have some thoughtful and touching moments. The mixture of comedy and touching moments can be a very fine line to walk on, but like a true pro, through Anderson’s masterful direction, the combination of comedy and sadness hits all the right notes, along with the Oscar winning score by Alexandre Desplat. 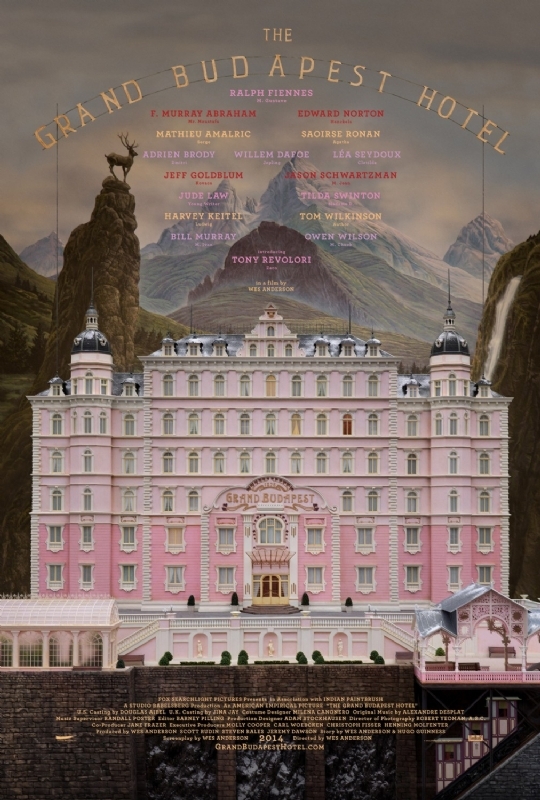 The Grand Budapest Hotel delivers the best service possible, so much so that you will find yourself wanting to book another stay many more times.